The name fruit leather may sound odd to you if you haven’t heard it before. And to be honest this stuff is pretty weird yet sweet and delicious. 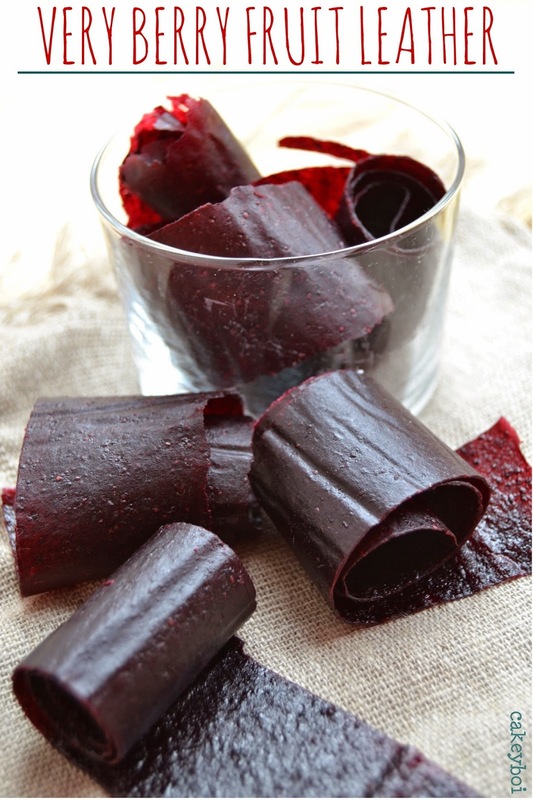 Fruit leather is like those fruit winder things that you can buy in the shops – long strips of fruity sweet. You know the ones. But mine are made with fruit, no added sugar and just a wee bit of honey. That’s it! Not bad at all. Kids love it as it’s a bit quirky and at least you know it’s made from only natural ingredients. It’s also perfect for using up fruit which is nearer the end of it’s life! Any fruit can be used really, but for the purposes of this demonstration (!) I used strawberries and blueberries hence Very Berry Fruit Leather. And I used my Optimum 9400 blender from Froothie to whizz up the fruit before I cooked it down. The blender whizzes up the fruit to a smooth liquid. Other recipes call for sieving the fruit after boiling, but to be honest that is a bit dangerous – as the fruit is scalding hot. Best to get it as smooth as possible before you boil it up. Use the biggest pot possible you have when boiling the fruit, unlike myself, who ended up with a very berry hob top! Once it is boiled and reduced, the fruit is poured onto a large baking sheet. Place it in a very low oven for 8 to 12 hours. I know it sounds a long time, but the oven is only set at 60C. I left it overnight and when I got up, the fruit leather was ready. Ready to peel off the greaseproof paper I had poured it on. I cut mines into strips with a pizza cutter. But you could cut into whatever shape you want. Remember, although these are made with only fruit and small bit of honey, the fruit sugars will concentrate when baked down. Fruit leather made from only real fruit and honey. Pre-heat the oven to 50C and line a large baking tray with greaseproof paper. Blend the washed fruit in a blender, with the water, until very smooth. Transfer to a large saucepan and bring to the boil. Knock the heat back to medium and let it bubble away for 15 minutes. At this point add the lemon juice to freshen the taste and add the honey for sweetness. You can add more or less to taste (careful, it is HOT!). Let the mix simmer on medium heat for another 15 minutes, stirring frequently. The fruit will have thickened and coat the back of a spoon. Transfer the fruit to the large baking sheet and place in the oven for 8 to 12 hours (I left mines for 9 hours). The fruit leather is ready when it is no longer sticky on the surface and feels dry. Carefully peel it from the greaseproof paper and cut into strips or whatever shape you choose. Wow. Never heard of this before but seems really original. I have a million ideas of what to do with it already. I may have to try it. I have some strawberries left from my last bake that need doing something with. I fancy trying it with maybe Kiwi Fruits! Not sure why, but there you go! Love it! I've had this on my list to make all year but have never got around to it. Yours looks fantastic! Great recipe! I keep meaning to make my own fruit leather. It's worth having the oven on overnight Dannii! It should keep for one month at room temperature. Don't keep it in the fridge though - too much moisture in there will make it go too sticky! This looks fab. I love the action shot of the hob, pleased I'm not the only one who makes a mess like that whilst creating! I am a very messy cook according to Disneyboi! This sounds fab I am going to give it a go. What fruit would you use Nayna? I grew up on fruit leather as a kid - mostly apricot and peach and guava - but I have never tried making it myself... Absolutely stunning colour!! You are on fire with the fab Froothie recipes, Stuart! This looks SO pro. And crucially, so easy. Fabulous recipe and instructions. I can see this going in lunch boxes up and down the country. Love fruit leather. Never made it but is on my to do list - quick question is it necessary to boil the fruit, if you are cooking / dehydrating it anyway - though I guess it keeps better shelf life. Not an expert Nazima, but I'm guessing the boiling is to reduce the water content. If you just liquidised it then baked it, it would take a lot longer than the 8-12 hours to become fruit leather. It is a lot thicker once boiled. Yum. Having seen this made on Hope & Greenwood's show this week I am more tempted than ever...although your hob is a warning to me to watch the pot!!!! Yes, I got in there just before Mrs H and Mr G - must be 'on-trend'! It's a bugger to clean tho Janey! !